MassDOT used the INVEST Project Development (PD) module to evaluate the Casey Arborway Project. This project replaces a 1950s-era elevated highway with an at-grade roadway and provides strong multimodal connectivity. Through the INVEST evaluation, MassDOT gained insight into the challenges and opportunities of planning for sustainability in roadway projects. This case study focuses on MassDOT’s use of the PD module to assess the Casey Arborway Project and highlights ways in which MassDOT can improve the sustainability of future projects. Improving sustainability and understanding sustainability performance aligns with MassDOT’s GreenDOT Policy, which is a comprehensive environmental responsibility and sustainability program. GreenDOT integrates sustainability principles into all aspects of MassDOT’s planning, design, build, and operational processes. This policy is reflected in the 2012 GreenDOT Implementation Plan. The Monsignor William J. Casey Overpass is a 1,650-foot long elevated section of Route 203 that passes through the Jamaica Plain neighborhood in the City of Boston. 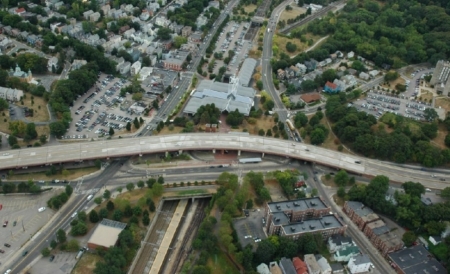 The existing overpass is adjacent to a subway station and very close to several prominent destinations, including Franklin Park, the historic Forest Hills Cemetery, Shattuck Hospital, and Harvard University’s Arnold Arboretum. The overpass was found structurally deficient in 2010 and beyond the point of effective repair. This overpass replacement project calls for the removal of the overpass and the construction of an at-grade roadway network, as a means of removing physical and visual barriers that divide the neighborhood. The new design incorporates multimodal uses with wider sidewalks, three miles of new bicycle paths, an upgraded subway station, as well as a more convenient bus station layout. Several innovative design features were incorporated to improve levels of service, ease congestion, and increase safety, including a “bow-tie” roadway pattern that enables east/west left-turns at the corridor’s two major intersections to be made as more efficient right-turns, a bicycle roundabout, and the replacement of an unsafe rotary with a new, signalized 4-way intersection. The project will result in the reconnection of the Arborway and Emerald Necklace (a 1,100 acre chain of nine parks linked together by linear parkways and waterway) with the Arnold Arboretum to Franklin Park. Overall project goals included enhancing circulation for all modes and users; promoting transportation choices; increasing neighborhood connectivity; establishing a sense of place to celebrate the area’s architectural, transportation, and open space history; and integrating sustainability into design concepts. Existing Conditions: The Casey Overpass is an elevated section of Route 203 that passes through the Jamaica Plain neighborhood in the City of Boston. Beyond the multimodal design and traffic safety features, the Casey Arborway Project incorporates numerous sustainable features to improve the roadways’ aesthetics and environmental performance. Green space will be expanded by 1.3 acres and more than 550 native trees will be planted to increase site vegetation. The project will reuse granite and cobblestones from the overpass into the new at-grade roadway, incorporate permeable pavers, and minimize light pollution. New open space, landscape features, and pedestrian amenities will create an urban park, highlight historic information about the neighborhood, and replace this missing link in Boston’s Emerald Necklace system. A strong emphasis on public outreach included the early formation of a Working Advisory Group, which evolved into a Design Advisory Group. MassDOT held more than a dozen advisory group meetings and six public meetings during the design phase. The agency has continued to hold additional public meetings during the project construction phase. MassDOT held a full-day INVEST workshop with the project team after the design was finalized and prior to construction to evaluate the project using INVEST. Attendees included the project management team, landscape architects, traffic engineers, transportation planners, highway designers, pavement specialists, public outreach specialists, architectural historians, members of the MassDOT GreenDOT program, and partners such as the Department of Conservation and Recreation. MassDOT also included highway designers, environmental engineers, and others who were not involved in this project to provide an opportunity for outside input and for them to learn more about INVEST and developing sustainability-focused projects. 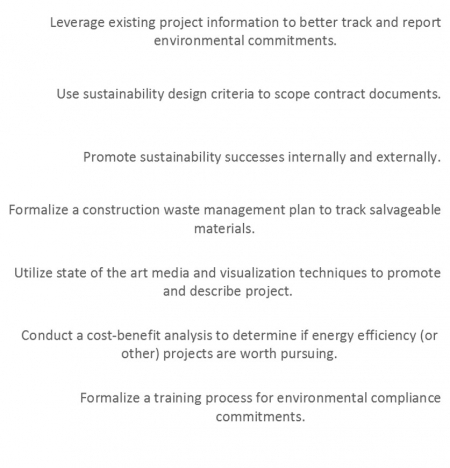 Develop new initiatives to help MassDOT achieve greater sustainability. The Casey Arborway Project aligned with INVEST’s “Basic Urban” scorecard, though the emphasis on parkways led MassDOT to add PD-16 Scenic, Natural, or Recreational Qualities, for the evaluation of the Casey Arborway Project. This modification required use of INVEST’s Custom PD Scorecard, for a total of 25 PD criteria. The workshop included small group breakout sessions where attendees scored the project based on the INVEST criteria and came back together to compare the score with other small group’s scores based on the same criteria. As the groups aimed to reach consensus on their scoring, this forum provided an opportunity to discuss their approach to sustainability and lessons learned that will benefit future projects. The Casey Arborway Project scored 58 out of 108 possible points, which reflects a strict literal interpretation of scoring. With a score of 54 percent, the Casey Arborway Project achieves a Gold achievement level under the INVEST rating system, which highlights the number of sustainability features incorporated into the design. However, workshop participants were uncertain about how closely to adhere to the specific requirements of the criteria questions. The participants debated whether points should be awarded based on a literal reading of the criteria’s requirements or based on the intent of the criteria. If criteria questions were interpreted as the participants felt was intended, rather than with the strict and literal interpretation, the project would achieve Platinum level with over 60 percent of the total points awarded. An example of uncertainty in scoring is PD-4 Highway and Traffic Safety. Workshop participants noted that although rigorous methods were employed to ensure vehicle, pedestrian, and bike safety as part of the Casey Arborway Project, they ultimately decided the project should not qualify for the total number of INVEST points available because the methods used on the project did not strictly follow those outlined in INVEST. General guidance on whether INVEST scoring should take a literal or intent-based approach toward scoring would be valuable. 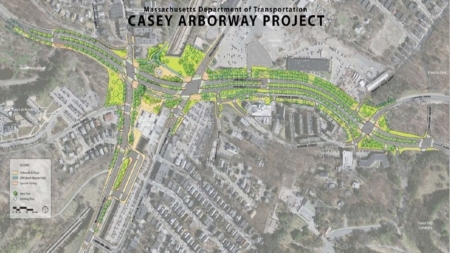 Examples where the project team thought that the Casey Arborway Project exemplified sustainability, but did not receive points, included reducing the amount of impervious surface and stormwater generated and integrating multi-modalism into the project beyond the elements considered in INVEST. Opportunities for improving sustainability outcomes were identified through the INVEST evaluation and are identified in the following discussion of sustainability initiatives. Each breakout group identified potential sustainability initiatives for group evaluation. After the breakout sessions, the workshop reconvened to discuss and evaluate each group’s priority sustainability initiatives. The group discussed the associated costs and implementation challenges for each initiative. 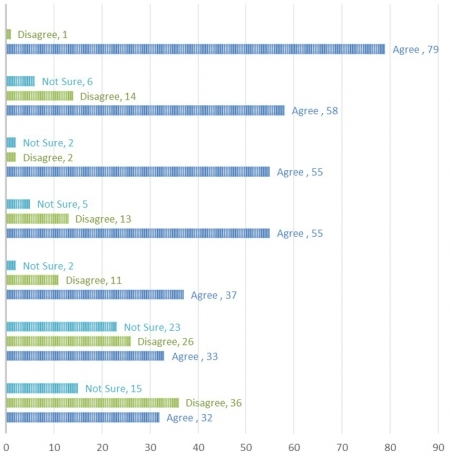 Real-time polling software was used to enable attendees to anonymously participate in a series of polling questions to gauge general agreement, disagreement, or uncertainty. Figure 1, below, lists the priority initiatives evaluated during the group polling. MassDOT is using the information gained from the INVEST PD workshop to evaluate opportunities for improving sustainability at MassDOT. Priority initiatives resulting from the workshop are being further evaluated for implementation. MassDOT reaffirmed the sustainability of the Casey Arborway through the INVEST scoring system. MassDOT has more tangible and measurable sustainability performance data to share with future project designers, stakeholders, and the community. MassDOT gained insight into the challenges and opportunities of planning for sustainability in future projects through a discussion of the project based around INVEST. MassDOT achieved each of the four original goals described above, including introducing the INVEST framework to MassDOT staff, highlighting current best practices, identifying ways to align projects with INVEST, and developing new initiatives. Based on the post-workshop survey, 59 percent of respondents noted that they are likely to use INVEST as a sustainability resource in the future. The strong efforts toward sustainability in the Casey Arborway Project provide many lessons for future projects.